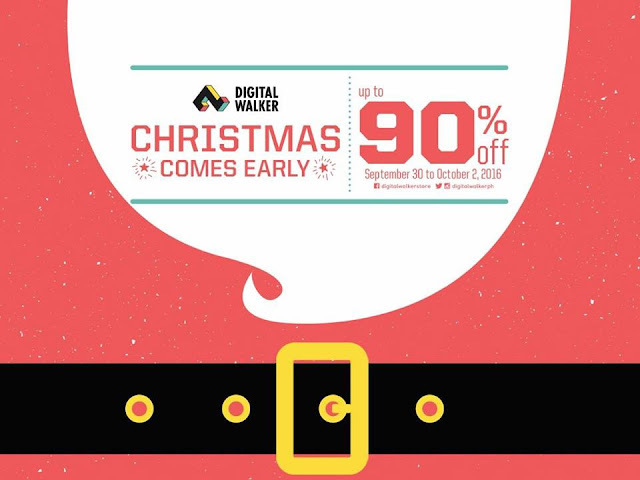 SALE ALERT: DIGITAL WALKER CHRISTMAS COMES EARLY SALE! Digital Walker welcomes all gadget and tech enthusiasts at SM Megamall ‐ Mega Trade Hall 3 from September 30 to October 2 for their very first Christmas Comes Early Sale. With discounts up to 90% off, it’s definitely an early Holiday treat for the tech crazy fans out there. The much‐anticipated sale includes several well‐known brands such as Fitbit, Belkin accessories, Coloud headphones, Marshall speakers, Crumpler bags and more. The three‐day event has surprises in store for lucky buyers. A raffle promo is open to anyone with a minimum purchase of PhP3,000.00 while one lucky customer per day will get to take home one of these coveted gadgets: iPad Mini4, iPhone 6s, or a Marshall Woburn amplifier! There will also be lots of random giveaways during the sale. Digital Walker carries the widest selection of consumer technology products that range from smartphones, tablets, cameras, cases, speakers, headphones, earphones and many more. Whether you’re a true technophile or just someone who just wants to enjoy technology, Digital Walker surely has the product that’s perfect for you. Nice at perfecto para sa pasko at para narin pang xmas gifts. Most wonderful time of the year especially for the geeks like me, yun lang hindi ako umabot. Payday is sooooo late! Bagay yan sa kapatid ko and mga friends kong todo geeks! grabe sale sila! !